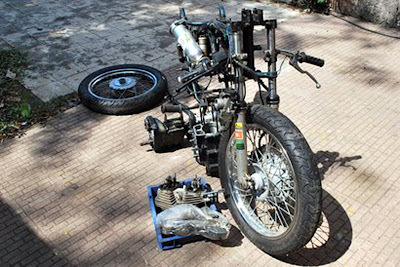 Blogger Kunal Bhaskaran is describing his ground-up remaking of his Royal Enfield drag bike in his Monster Bike blog. Bhaskaran runs a motorcycle shop in Pune, India. He says he rides a 535 Enfield Bullet in preference to all other transport. He has raced his drag bike for three seasons but, after the 2008 races, took it completely apart with plans to extend the frame six inches (for greater stability) and switch from four-speed to the new five-speed transmission. In the process, Bhaskaran has changed the five-speed transmission to shift on the right, which he considers the proper side! 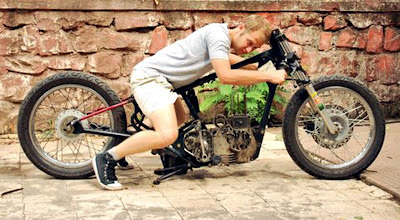 He is obviously a determined and talented bike builder. So far, he says, there has been no "visit" from the dreaded "Mr. Murphy."